Welcome to the You CAN Go the Distance! online community! This site exists for a single purpose: To help you go the distance by giving you the confidence and the resources you need to move past your fears or self-doubt and achieve your goal of running a marathon. Within the pages of this site you will find all of the chapters of the book. Some of the chapter pages will have the full text and others will have an abridged version of the chapter from the book. But ALL of the chapter pages will have a comments box at the bottom that you can use to leave comments or ask questions! So take a look around and let us know what you think. The site is still getting some updates, so please pardon the cyber-dust! Great book! 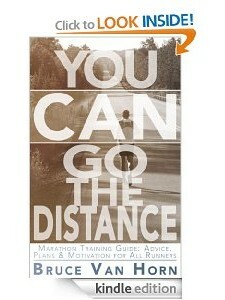 Running my third marathon this Sunday, and this book gave me some great pointers! Your book is GREAT Bruce. You got me started when I had no other coach! #gratitude. Question: I read once … it takes a slight incline about 2 degrees on a treadmill to simulate the difficulty of running on flat ground without the ground moving under you, as a treadmill does… it might have been in Runner’s World, can you or anyone here confirm? Just signed up for my first full marathon after reading You Can Go The Distance. Looking forward to the journey.